Being a Los Angelino now for quite a while, I thought I would eradicate some myths for you tourists out there visiting the city and give you a list of things you might want to see. First of all, unlike the majority of European cities, there is no “center.” Los Angeles is urban sprawl at its worst, extending nearly 50 miles in any direction. Good luck seeing the city in a few days. There are definitely areas you do NOT want to tread, nor for most purposes, unless you get lost visiting USC, will you have any reason to step foot into South Central or East Los Angeles ... unless maybe you have a relative in the Crips, Bloods, or MI-6. If so, tell them I say hi. Also unlike most European cities, the public transport system in LA is poor. In order to see it properly, you really need a car, preferably one with GPS (or use your phone). If you make a wrong turn, especially during rush hour, it can take you twenty minutes to get back to your original location. Driving in LA is Not fun. You simply want to be OFF the road during rush hour, lest you spend all eternity and then some in your auto. 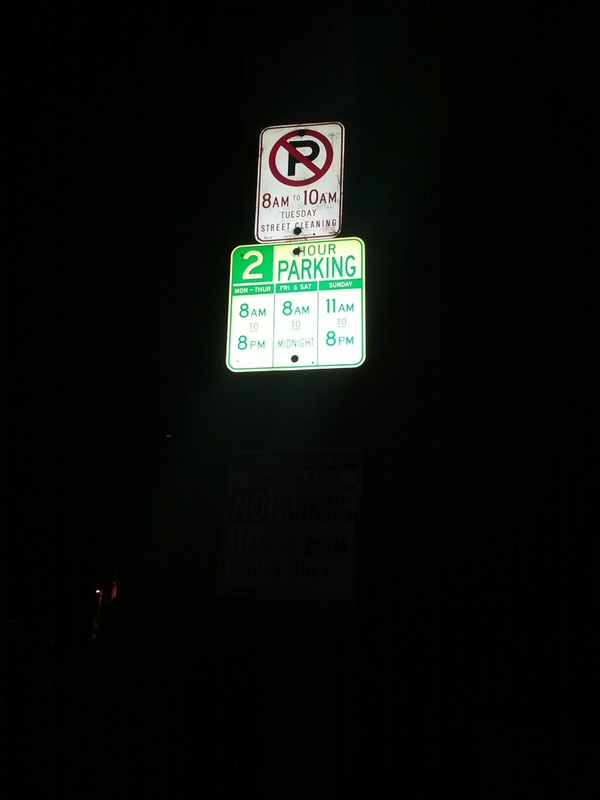 To boot, you need to read and re-read the street parking signs to insure you don’t get a ticket. Parking enforcement in Los Angeles is about as efficient as government can be, and is a primary revenue driver for the city. The tickets ain’t cheap! 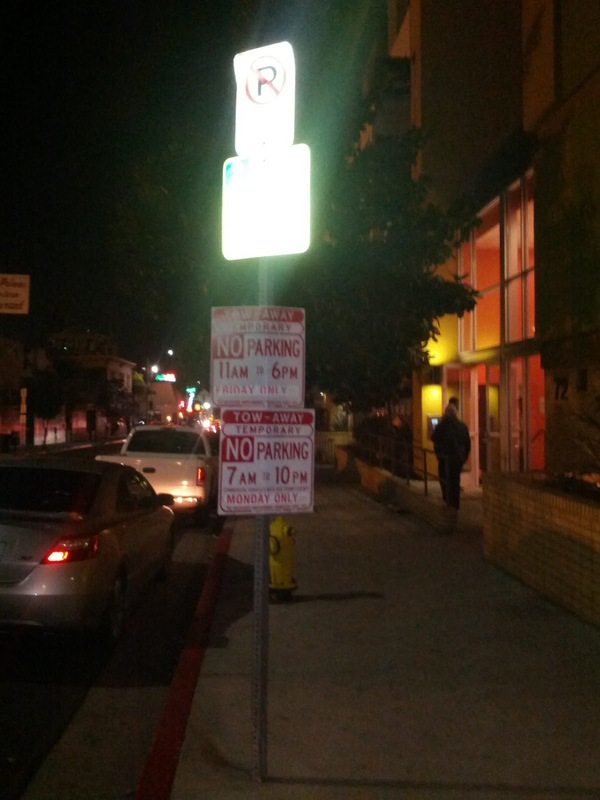 Hollywood parking notification. You need a PhD with hours to kill to decipher it. The weather. Best thing about this area of the world, and why so many people choose to live here. I can’t imagine intentionally living in an area that is cold and rainy or gets a lot of snow. When you come to LA, make sure to choose outdoorsy activities. 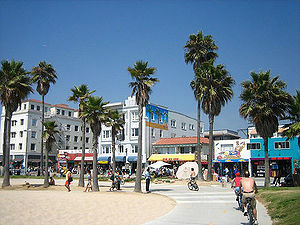 Venice Beach -- one of the coolest things in Los Angeles. Go get a T-shirt, some junk food, get some custom made clothing/ shoes with your photos on them at The Ave. on Winward (right by the beach), rent some rollerblades and go up the bike path, get a boogey board and jump in the water, watch some of the free shows put on by performers, tip if you like them, or just people watch. Either way, you’re going to have a fun time. The Getty Museum—If you’re a lover of fine art, you can’t go wrong with the Getty. Best of all its free! LACMA + The La Brea Tar Pits—Situated side by side to one another, you can get into the La Brea tar pits and see fossils of ancient mammals, and the actually oily pits where the animals encountered their demise by venturing in. Also there are several museums with fine art and artifacts of the world (LACMA) for those of you into that sort of thing. Comedy Shows- I kid you not, the comedy shows in LA are likely the best in the world, and you can often catch celebrity comics like Joe Rogan, Dane Cook, amongst others. You want to go to either the Comedy Store, The Hollywood Improv, or The Laugh Factory. They are all fairly close to one another in West Hollywood (the gay district of LA) and are usually a lot of fun. Please don’t heckle the comics. Mann’s Chinese Theater + Hollywood Walk of Fame- Here you will see all the stars and handprints of Hollywood, from Lucille Ball to Jim Carrey. Outside Mann’s you’ll see many people dressed up as comic book/ movie characters trying to earn a living. Parking is an arduous task in this area of town, so be prepared to pay. This is a highly touristy thing to do, but if you've never been in town, go ahead. 3rd Street Promenade in Santa Monica- Great upscale place to walk around, and grab some food. The Apple Store is located here. The Grove- Similar to Promenade, but a little bigger. A big shopping center in the Hollywood area. Very popular and busy. Nice place to walk around. Skidrow- Want to see where they put all the homeless people, it used to be skid row in downtown LA (right by the Staples Center) … police used to pick up vagrants and just drop off ‘em off in the area. Now that downtown is being developed this is changing, but the soup kitchens and shelters are still there, and you can go volunteer if you want to spend a day this way. Disneyland + 6 Flags Magic Mountain- Although Anaheim is technically not part of LA, and at least a good hour away, Disneyland is a must see for those of you travelling here with children. Magic Mountain, in Valencia, is great if you are into roller-coasters. Be prepared for long lines in both parks of course. Universal Studios- Definitely, without a doubt, worth experiencing once. It's fun, but quite expensive for one day, so make sure you've saved up. Self Realization Fellowship/ Lake Shrine- Located in Pacific Palisades and by the ocean, this is a crown jewel of Los Angeles. Hidden, and not as visited as other sites, it's a breath of fresh air and tranquility in an otherwise super busy metropolis. It's free, and the grounds are stunning. Walk around the lake or just sit down, talk, or meditate. Celebrity Insider Tour-- You see so many of these tours going around LA, this one was voted #1 on trip advisor, and I have seen the host perform around Los Angeles, and he is very funny and witty. The tour doesn't go everyday, but if you're into this sort of thing, I advise you try it out over the others. LA Does have nightlife, but everything closes down at 2 AM with last call @ 1:30 by city ordinance. The “happening clubs” are always changing, but you can definitely see some pretty people in them. LA attracts the best looking people from around the world, generally with severely needy egos, who want to make it in the entertainment industry. Believe it or not, LA has some excellent hikes. Go up to Malibu (a bit of a drive) and take this trail. You’ll see some gorgeous views of the Pacific. Or go hiking in the Temescal Canyon area. You aren’t likely to see a lot of wildlife, but maybe the occasional snake, rabbit, or deer might be spotted. LA is a huge sprawling metropolis, and it’s not a place to play by ear, with everything close by like Prague might be. You can definitely have fun here, and the weather's great, but avoid rush hour traffic, and bring some sunscreen. Thoughts, leave me a comment below. Thanks so much for the nice comment brother. Glad you enjoyedmy Oz commentary. I have never been to Greece, but I have heard this much from everybody who's been. Stay OUT OF Athens. Greece is almost impossible to navigate business wise. Hope to see you sometime! Comments, well, might as well can't dance.